Your projects have photos, notes, and audio.? How are you keeping it all organized??? Well, DISH customers just lost CBS! They are going to miss A Very Grammy Christmas tonight... AFC football on Sunday... the Victoria's Secret Fashion Show! Gosh, wouldn't it be great if there were a way to get broadcast channels without having to worry about blackouts? In the United States, you have a federal right to install an outdoor TV antenna. That's right, it's the law. More Americans are re-discovering the value of broadcast TV programming with the use of a television antenna. 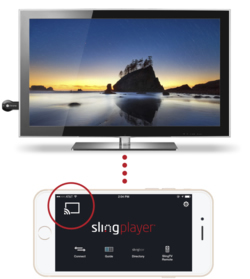 Sling Media has announced Slingbox support for Chromecast through their Slingplayer apps for iPhone, iPad, Android phone and very soon Android tablet. They have integrated the ‘Cast’ icon into our Slingplayer apps giving those who have a Slingbox the ability to watch their living room TV on another TV in the house or a TV in a remote location using a Chromecast device. PHOENIX, AZ – September 15, 2014 – Channel Master, the nation’s leading manufacturer of broadcast reception products since 1949, today announced the integration of Pandora Internet Radio into its DVR+ platform, as well as new shipping and finance options that make it easy for consumers to own the ultimate TV Freedom solution without fees or contracts.